Here we are with a new reportage from the Milano HiEnd Show. The show, born in 2000 as a meeting point between audiophiles and companies of the two-channel only audio business has lost nothing of the original attraction. On the contrary, being more... accessible than the Top Audio (the other Milan event), for several reasons, to smaller companies, it proved to be an "incubator" of new smaller shops. For sure, some of the companies present in the first editions disappeared, others have gone different ways, the same presence of a twin show in Rome makes a difficult decision necessary for others. In any case, the show is getting more and more interesting even for "mainstream" importers and distributors of HiFi products: perhaps at this point they are realizing too that yes, the audio-video market is interesting and for sure very profitable, but the figures are clear: the cost of an HT system is far higher than the one of a 2 channel system of the same quality level, but also the number of potential buyers is more than proportionally reduced. Another aspect that it is worth taking into examination is the presence of foreign companies, and with a rather high profile too. As a matter of fact, these shows, far from being in difficulties, seem to be entering into a new, happy season. Not so much to say about the organization. The venue and its limits are well known. The... acoustic permeability problems of the walls between the rooms seem to be impossible to solve, so quite a few exhibitors have adopted the time sharing technique: in a very civil manner, they have agreed to play their systems alternatively, half a hour the one and half a hour the other. From the point of view of contents, instead, there is some new entry, even though scarcely in evidence. The new technologies are getting some effect on the market. One of the (new) exhibitors based in practice all his product line on class T, others had products in similar classes. The number of persons which having a positive experience with these technologies is increasing day by day. By the way, you can discuss for sure about the absolute sound quality of a T-Amp, but it is clear to anyone that the cost/quality ratio is very very high. For sure there might be who prefers a softer, round, tubey sound, there is little to discuss about tastes, but in any case up to few years ago there was nothing comparable at these prices, and today there are class-d units perfectly mimicking the sound of tubes at a fraction of the price. The same fact of presenting a small and light box which fully substitutes the huge Class A amplifiers we are used to is a real revolution. On the other side, in a market where prices tend to raise out of any logic, this revolution can only give positive effects, supplying with low cost solution for whoever is interested in good sound, more than to show an impressive system to his friends. 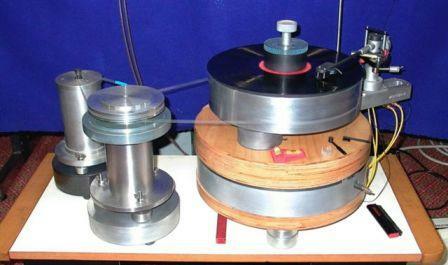 Is this the end of High-End and the coming back of a Golden Age with good sound for everyone? I do not think so. The golden age , in Italy at least, took place at the beginning of '70s when people was getting available to spend a lot of money (for the time) to buy decent audio systems, an attitude which was for sure favoured by the perception of hifi as a cultural and technological must, and in particular by a probably irrepetible musical season both in classical and modern music. Today MP3 micro players are playing the role of the must (even though, finally, I am now hearing someone lamenting the low quality of the mp3 contents), and the music and musical culture crisis seems evident. Someone even says that anything that could be written with the Western musical notation has already been, so there is nothing new to invent - hopefully only a vary bad excuse for complete lack of ideas. Which will be the role of HiEnd, then? For sure the high level HT buyer, less interested in purely qualitative aspects, will go on buying in this area, as suggested by the omnipresent consultants/installers/suppliers/etc/etc (is it possible that no one perceive the interest conflict in the combination of all these roles???). Also the non discerning two channel audio buyer, with so much money and scarcely any audio competence, will do the same. Who instead is able to make his choice without prejudice and only based on absolute quality will in most case look elsewhere. Not always, because not all that is big, costs a lot and shines is not worth its price. As I have heard in the HiEnd gangway, "Oh, here is MBL, no need to go in, we know they sound very well..."
Even under this point of view, there was something new at Milano HiEnd. Let's go for a fast ride through the stands. For what regards the sound, as usual we do not think it possible to give any serious evaluation in a non controlled environment, but I must say that what I heard was really very interesting. If you intend to spend 44 thousand euros for a converter, I think it might be the case to take it into account, its name is Trinity, is designed and produced on request in Germany and the company is GTE. 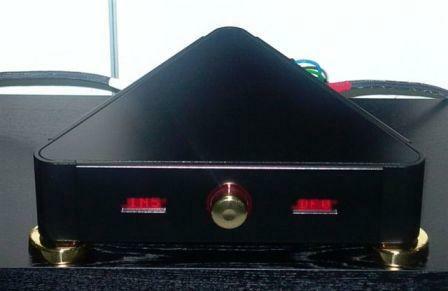 T-HiFi, apart the name, bases all its product line on Tripath class-T, the T-Amp technology. 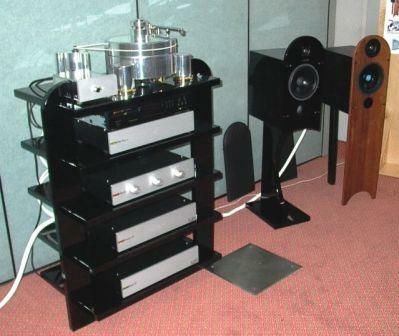 There are power and integrated amps, in kit or completely mounted, various components and also loudspeakers. Best Audio&Video presented, as at Rome, WLM products. Dynamics were a little more controlled than in Rome, but this was in the end positive, given the acoustic isolation problems. 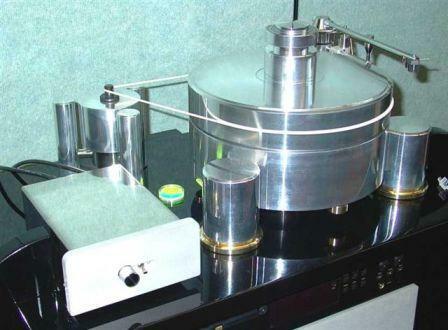 In the T-HiFi room there was also this nice turntable, built practically by hand, and with a price tag that, if is not really a t-price, is however very interesting if compared with the competition. Finally, Sound Of The Valve presented in static exhibition a prototype of a new loudspeaker equipped with a magnet in Maxalco Co., which is superior also to AlNiCo 5, with a flux of 24.000 Gauss, the highest in the world, according to Stefano Zaini, organizer of the HiEnd exhibitions, whom we thank as usual also for the photos. 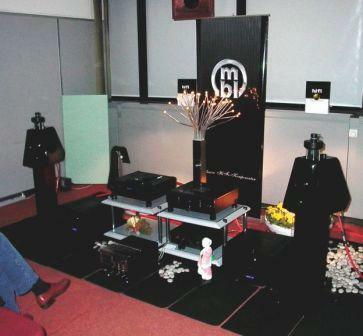 Next HiEnd, in Rome on October 28th and 29th, 2006 in the usual seat of the Centro Congressi Midas Jolly Hotel.